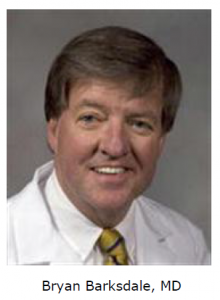 Dr. Bryan Barksdale is a cardiologist at the University of Mississippi Medical Center. Over the past 20 years, Dr. Barksdale has provided knowledgeable and compassionate care to the Kosciusko Community through his Outreach Cardiology Clinics. He understands the hardships of traveling to Jackson for many patients and knows how imperative it is to have good quality care available. He is very proud of the strong relationships he has formed over the many years not only with the outstanding physicians at the Kosciusko Medical clinic, but with the wonderful and kind-hearted patients as well. He feels that his bi-weekly face to face interaction with patients, the physicians and staff is crucial in providing excellent patient care, establishing trust and ultimately better patient outcomes overall for Kosciusko and the surrounding areas.